Circa 1875. Unsigned European oil on canvas painting. Very detailed romantic scene of a young couple gathering flowers in the woods. Beautifully done in bright colors, this idyllic scene features a river with swans and birds, lit by sunlight filtering through the trees. This painting comes with an original period frame that matches the painting perfectly. 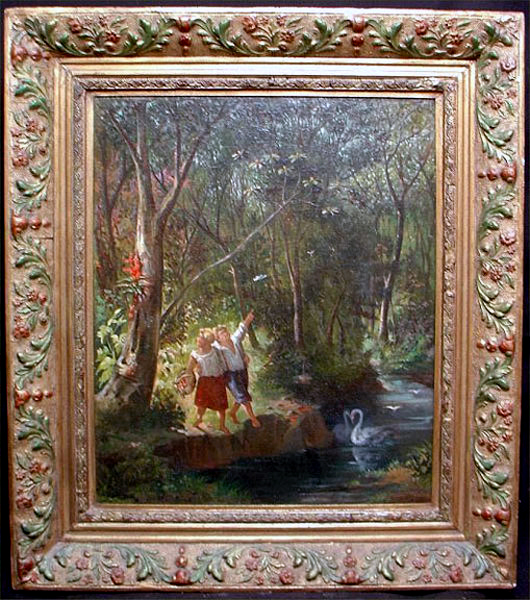 Both the painting and the exceptional original frame are in fine condition. The painting has been relined. 26" wide x 29 1/2" high. Price $1,700.